Pictured at top: Grilled Vidalia Onions; above, Easy Baked Chicken Drumsticks. This Chocolate Cream Pie recipe is made easier by using a store-bought crust. Every once in a while, I find myself gazing at the big packages of chicken wings and drumsticks in the grocery store and imagining a big plate of them, crispy and juicy, making its way to the table for my guys to munch on while they have their friends over to watch a game. Then reality sets in and I remember that the chicken usually doesn’t turn out like that unless I use a brining process, which takes more time than I have, so I leave the chicken behind. But I recently learned a reliable way to get that juicy, crispy chicken I envisioned. If you brush the chicken skin with a little egg yolk first, then add your favorite seasoning, the seasoning will stick to the chicken and the yolk helps the skin crisp up, leaving the inside nice and juicy. I’ve tried this method on wings, thighs, drumsticks and bone-in breasts and it’s worked every time. If you’re looking for a quick way to make crispy chicken without frying it, this method is a game-changer. If you’re looking for something to serve with that delicious chicken, fresh spring Vidalia onions are showing up at many grocery stores. These look like big scallions with giant bulbs. I walked past a pile of them at the store (they’re kept with the chilled produce, not with the regular onions, because the greens are still attached) and I just had to pick some up. I’ve spent a substantial amount of time in Mexico where sweet onions are cooked and sold as street food. They’re seasoned with lime and salt and slightly charred on the outside and are incredibly tasty. 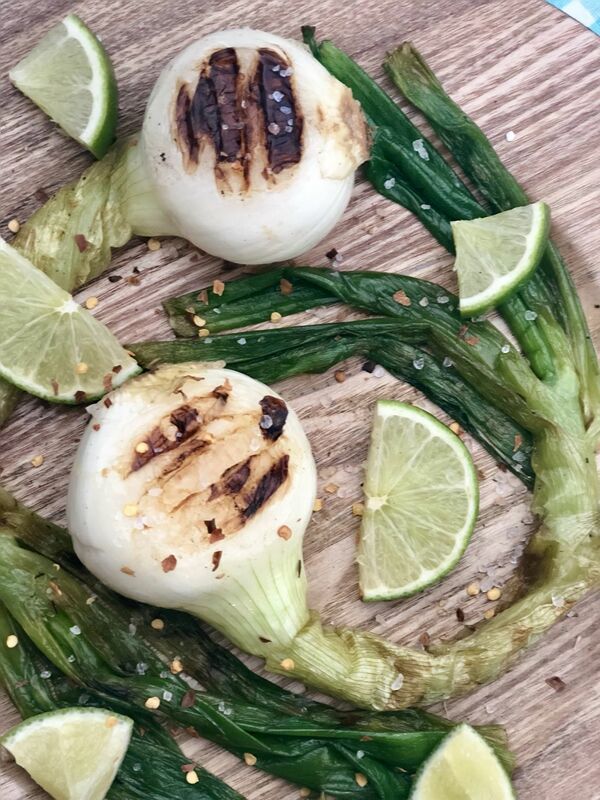 When I saw these onions at the store, I had to pick up a bunch so I could try to replicate the cebollas deliciosos I remembered. I brushed them with a little olive oil and seasoned them with salt, then put them on the grill. 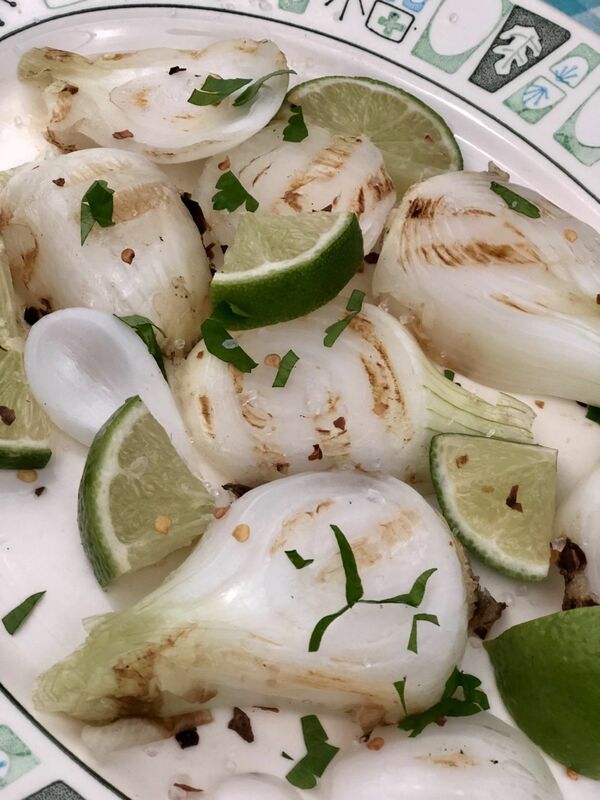 Once the outsides of the bulbs had charred a little, I realized my onions were a little too big to enjoy the same way you would on a sidewalk in Mexico City, so I sliced them into thirds and set them back on the grill for a couple more minutes, then served them with lime and a pinch of red chili flakes. Excelente. Chocolate cream pie was also on the menu. Everyone at my house loves chocolate and I am always happy to oblige, but I’m not always up for baking. This recipe, using real whipped cream and chocolate instead of store-bought whipped topping and pudding mix, produces a decadent pie without too much fuss. It’s a perfect ending to an easy, spring dinner. Lightly spray the top of a broiler pan with cooking spray. Add the yolks to a small bowl and whisk together. Coat each drumstick with egg yolk using a brush and then set the chicken on the broiler pan. Sprinkle with seasoning and set in an oven preheated to 375 degrees. Bake for 12 to 15 minutes or until a meat thermometer inserted in the thicker part of the drumstick reads 165 degrees. Brush each onion with olive oil and set over a grill heated to medium high. Cook for about two minutes or until grill marks are present, then turn over and grill the other side. If you prefer the onions softer, slice them in half, brush again with a little olive oil, and return to the grill. Grill for an additional 1 to 2 minutes, or until softened and lightly charred. Remove from grill and season with Kosher salt. Serve with fresh lime wedges. Add the yolks and cornstarch to a bowl and whisk together; set aside. Add the sugar and milk to a saucepan and set over medium heat. Whisk together while heating to a simmer. Once the milk is simmering, add about two tablespoons of the hot milk to the egg yolks (this tempers the egg). After tempering the yolks, slowly whisk them in to the remaining milk mixture, whisking constantly. Heat until sauce thickens and comes to a gentle boil. Remove from heat and whisk in the butter, chocolate and vanilla and stir until smooth. Pour the mixture into the prepared pie crust in an even layer. Set in the refrigerator and allow to chill for three hours. To prepare topping (optional) add the whipping cream to a bowl and beat for about 3 minutes with an electric mixer. When the cream starts to thicken and soft peaks form, add the cocoa powder and powdered sugar and beat for an additional minute. Top the pie with the cream before serving. if desired.